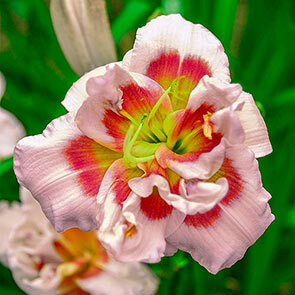 Uniquely beautiful, this highly decorated, reblooming daylily is a cut above the rest! Double, pastel-pink, 5" flowers have bright, rose-red eye zones and chartreuse throats. 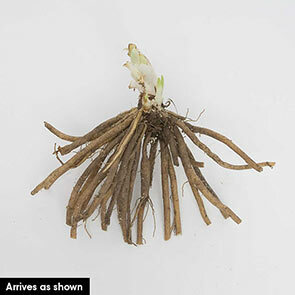 Drought tolerant and able to thrive in all types of soils. Winner of several esteemed prizes including the 1998 Ida Munson Award. Midseason flowering and reblooms in late summer to early fall. Evergreen foliage. Ht: 24"
Double Daylilies Not only do our double daylilies have two times the number of petals, but they are prolific growers in any soil type and long-lived in the garden. Their sunfast blooms hold their colour well in intense sunlight. Some are so vigorous, they will bloom not just during midsummer but again in late summer to early fall for double the flower power!